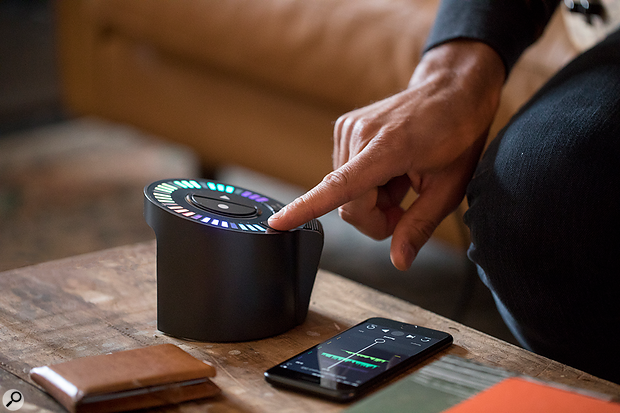 Plug-in makers iZotope have announced their first foray into the world of hardware with Spire Studio — an easy-to-use, portable wireless audio recorder designed to be quick to set up, so as not to interrupt the creative flow. The Spire Studio is as much for musicians who are new to recording as experienced producers and engineers looking to augment their recording setup. Because it can be battery powered, has a built-in mic and thanks to its form, it can happily sit in a living room, green room or on a tour bus, ready to capture inspiration as it strikes. If you want to do more than capture ideas, it also has two XLR/quarter-inch combo jack inputs with phantom power for external mics and instruments. It also features two stereo mini-jack headphone outputs for monitoring. Inside, the Spire Studio employs iZotope’s intelligent audio processing and mic preamps designed by Grace Design. On the surface, the LED display is touch-sensitive so you can quickly adjust headphone volume and select and mute tracks. For deeper editing and to control onboard effects, open the free Spire iOS app. The app seamlessly integrates with Spire Studio over high-speed Wi-Fi. Originally released in 2015, the app has offered tens of thousands of people a simple way to record, mix, and share songs. When used with Spire Studio, you can also share your tracks with fans, share projects to collaborate with friends, or export stems to continue working in your favourite DAW. The Spire Studio is currently in production and will initially only be available in the USA, but we expect to see it in other countries soon. There’s no word yet on pricing, but we look forward to hearing more about this handy-looking little recorder.